Manufacturers in many industries face worldwide competitive pressures. These manufacturers must provide high-quality products with leading-edge performance capabilities to survive, much less prosper. The automotive industry is no exception. There is intense pressure to produce high-performance at minimum-costs. Companies attempting to adopt WCM have developed a statement of corporate philosophy or mission to which operating objectives are closely tied. A general perception is that when an organization is considered as world-class, it is also considered as the best in the world. But recently, many organizations claim that they are world-class manufacturers. Indeed we can define world class manufacturing as a different production processes and organizational strategies which all have flexibility as their primary concern. For example Womack et al. defined a lead for quantifying world class. Instead Oliver et al. observed that to qualify as world class, a plant had to demonstrate outstanding performance on both productivity and quality measures. Summing up we can state that the term World-Class Manufacturing (WCM) means the pursuance of best practices in manufacturing. On the other hand we would like to note that one of the most important definition is due to Schonberger. He coined the term “World Class Manufacturing” to cover the many techniques and technologies designed to enable a company to match its best competitors. When Schonberger first introduced the concept of “World Class Manufacturing”, the term was seen to embrace the techniques and factors as listed in Figure 1.1. The substantial increase in techniques can be related in part to the growing influence of the manufacturing philosophies and economic success of Japanese manufacturers from the 1960s onwards. 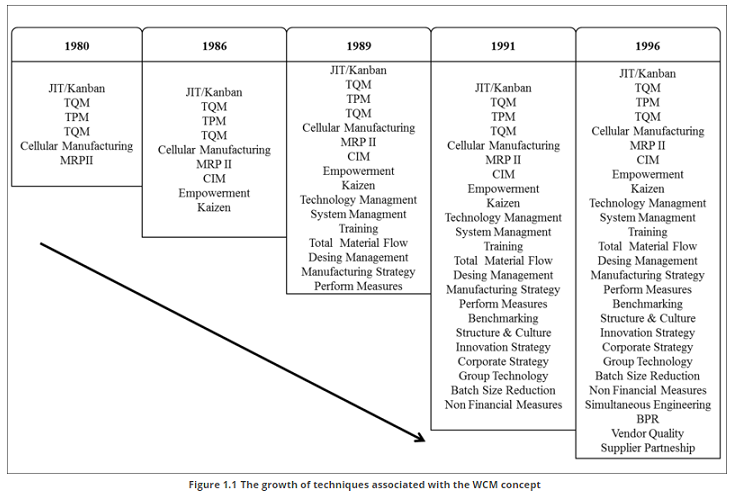 What is particularly interesting from a review of the literature is that while there is a degree of overlap in some of the techniques, it is clear that relative to the elements that were seen as constituting WCM in 1986, the term has evolved considerably. These techniques have been known for a long time, but with Schonberger, a perfectly integrated and flexible system was obtained, capable of achieving company competitiveness with products of high quality. 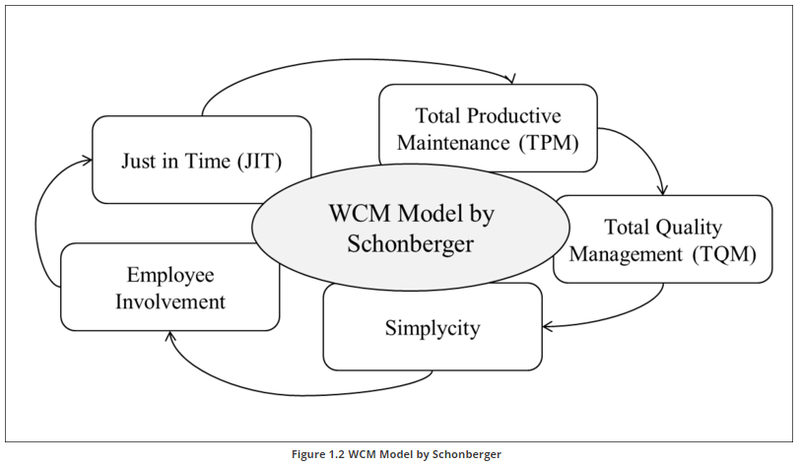 The WCM model by Schonberger is illustrated here above in Figure 1.2. 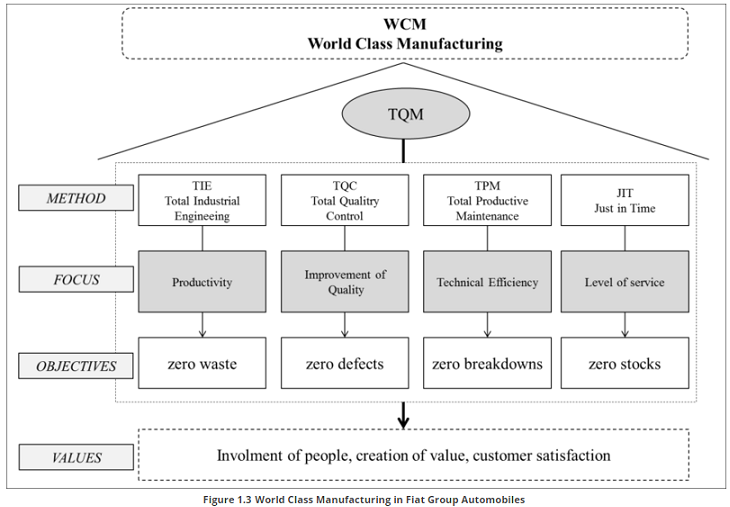 According to Fiat Group Automobiles, “World Class Manufacturing (WCM)” is: a structured and integrated production system that encompasses all the processes of the plant, the security environment, from maintenance to logistics and quality. The goal is to continuously improve production performance, seeking a progressive elimination of waste, in order to ensure product quality and maximum flexibility in responding to customer requests, through the involvement and motivation of the people working in the establishment. The WCM program has been made by Prof. Hajime Yamashina from 2005 at the Fiat Group Automobiles. The program is shown here below in Figure 1.3. Fiat Group Automobiles has customized the WCM approach to their needs with Prof. Hajime Yamashina from Kyoto University (he is also member of the Royal Swedish Academy and in particular he is RSA Member of Engineering Sciences), by redesigning and implementing the model through two lines of action: 10 technical pillars; 10 managerial pillars. The definition proposed by Yamashina includes a manufacturing company that excels in applied research, production engineering, improvement capability and detailed shop floor knowledge, and integrates those components into a combined system. In fact, according to Hajime Yamashina the most important thing continues to be the ability to change and quickly. 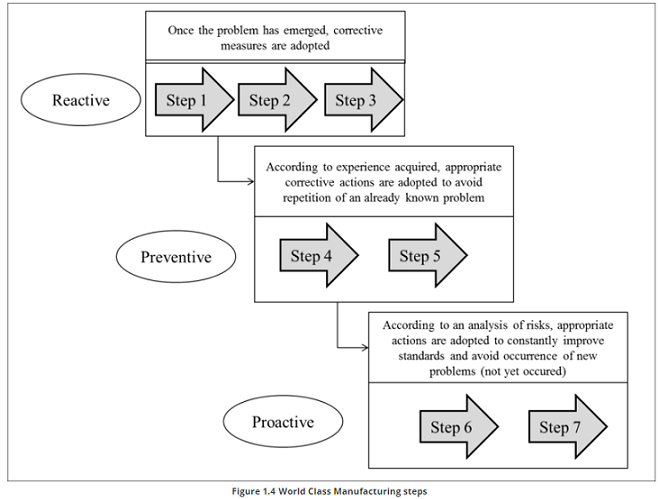 WCM is developed in 7 steps for each pillar and the steps are identified in three phases: reactive, preventive and proactive. In Figure 1.4 an example of a typical correlation between steps and phases is shown, but this correlation could change for each different technical pillar; in fact each pillar could have a different relation to these phases. The approach of WCM needs to start from a “model area” and then extend to the entire company. WCM “attacks” the manufacturing area. WCM is based on a system of audits that give a score that allows to get to the highest level. The highest level is represented by “the world class level”.